This article will teach you how to enable and use the Gift Wrapping module on your 3dcart store. Then use the search bar at the top to search for "Gift Wrapping"
The Gift Wrapping Options you specify on your store are similar to your store's product listings in the sense that you can edit the Gift Wrapping option's name, cost, price and even designate a display image. You can also set up a short description for each Gift Wrapping option you create. By simply enabling the Gift Wrapping option as described above, the store will create a default gift wrapping option on your store with a default "inventory" of 999999 units in stock. The next steps in our tutorial will describe editing the default gift wrapping option to meet your specific needs. Later on in this article, we'll also cover creating additional gift wrapping options to the store's selection. As mentioned above, enabling the Gift Wrapping Module will add a default gift wrap option to the store. Now we'll cover how to edit this default gift wrap option. You will be taken to the default gift wrapping option's listing screen. From here you'll be able to edit and further refine the default Gift Wrapping option. The gift wrap option's Store ID. By default, we label this "GIFTWRAP" but it may be changed as needed. The Gift Wrapping option's display name that will appear on the shopping cart when it is selected. By default, we label this "Gift Wrapping" but it may be changed to suit your specific needs if necessary. If your gift wrapping option costs the shopper an extra fee, this is the price you will charge for the gift wrapping service. Enter your Gift Wrapping service's cost to provide data for any Sales vs Profits reporting you may use on your store. Enter a short description of the gift wrapping option. Perhaps describe the type of gift wrapping that is being selected (paper, colors, bows, etc) or other details you need. This short description will appear to your shoppers when they select the gift wrapping option. Mark this checkbox if you'd like to omit tax charges from the gift wrapping option/service. Mark this checkbox if you'd like to hide the Gift Wrap option so that it is not selectable. This can be useful for seasonal gift wrap options that can be selected during certain times of the year (Winter Holidays, Halloween, Valentines Day, etc). If all available Gift Wrapping options are hidden on this page, then the ability for the shopper to select Gift Wrapping from the store's view cart page will still appear. However, the module itself will be inoperable. Therefore, if you plan to only offer seasonal gift wrapping services, we suggest turning off the Gift Wrapping option altogether during off season. In the field labeled "Include some files" you can browse to or otherwise specify a path to a thumbnail image example of your gift wrapping option. Perhaps an image of a gift wrapped item, or an example swatch of the gift wrapping paper used for this option. Once you have comleted your settings, click on the "Save" button at the top right to commit your changes. If necessary, you can add additional Gift Wrapping options to your store. This can be useful for situations where you would like to offer multiple gift wrapping options with their own incremental pricing (regular gift wrapping vs deluxe gift wrapping). Populate your fields as needed. As described previously in this article; the default gift wrapping option that is created along with the module is created with an "inventory" of 999999 units in stock. It's important to note however that when you manually create additional gift wrapping options for the store, those gift wrapping items will not be created with inventory stock. Therefore, as those gift wrapping options are purchased, you may encounter some with negative quantities in the store. Don't worry, the Gift Wrapping can still be purchased. It's just that you may encounter some of the gift wrapping items with inventory shown as -2 or something along these lines. Click on the "More" button at the top right to select the Inventory sub-menu. Once there, use the search filter at the top to locate your gift wrapping items and update the inventory as needed. The same basic steps will be needed if/when replenishing gift wrapping options. If you'd like, you can also import gift wrapping options by creating the usual Product CSV import. This can be extra useful if you have several gift wrapping options to add to your store. Once you create your CSV file and populate it with the appropriate headings and data, upload it as a product import and your store will be populated with the Gift Wrapping options. When you enable the Gift Wrapping module, all of your store's products will have Gift Wrapping automatically set as an option during checkout. However, you may have certain products where gift wrapping is either not necessary, feasible or available. Therefore, we've added a setting where you can omit individual products from having Gift Wrapping made available to them. Within the product's Information Tab, scroll down to the Options section (next to the "Pricing" area) and you will see a checkbox labeled "No Gift-Wrap Options"
Click the "Save" button at the top right of the page. The product is now omitted from having Gift Wrapping Options available to it. You can also do this via CSV Product Import by adding a column labeld "giftwrap_disabled" (minus the quotes) to your Product import CSV file. This column header will behave like a toggle switch where a 1 will disable Gift Wrap options from the product and a 0 will allow Gift Wrapping to be available for the product. When the Gift Wrapping Module is enabled, your shoppers will see a special link on their View Cart page labeled "Sending a Gift?" underneath each view cart item's listing. This link will allow your shopper to select any of your gift wrapping options for the item if they wish. The wording of the link can be easily changed in your 3dcart Online Store Manager's Store Language section. 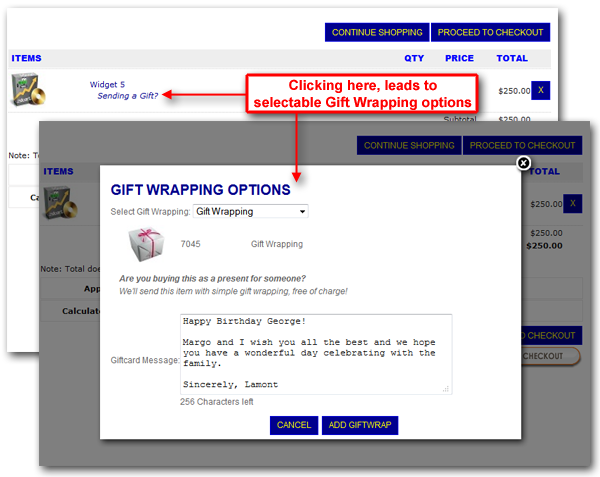 Use the Search Bar at the top and search for "giftwrap"
Within this section of the Store Language area, you will see the language variables used for each of the Gift Wrapping Module options. Each of these can be labeled to suite your store's needs. The one labeled "link" can be used to rename the link to your preference.